Wikipedia defines the Midlands as “an area comprising central England that broadly corresponds to the early medieval Kingdom of Mercia.” For me, I’m afraid it will always be associated with narrow paths and endodontics. 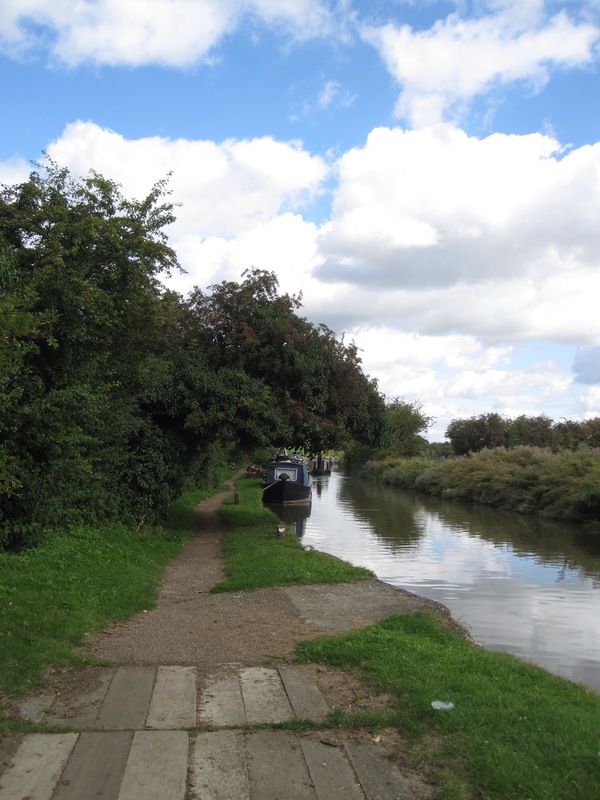 I never thought of England as having canals traveled by narrow boats upon which people live, but we have traveled many miles of canal paths and seen dozens upon dozens of narrow boats this week. While refueling with a stale Shot Blok on Saturday, I noticed a bit of trauma to my teeth. It got a bit worse that day, but nothing beyond what I had periodically noticed before leaving home (hmmm). It was noticeably worse Sunday while navigating out of Coventry (and rattling along canal paths) and by the time we reached Ravenstone it was a major concern. But, it was Sunday evening in a small English village, so I loaded up on Ibuprofen and we plotted a relatively direct route to Nottingham. Yesterday, we were able to make it to Nottingham by mid-afternoon (our most successful riding day yet), came upon an NHS hospital, and were kindly provided a list of dentists that take walk-in patients. Maureen found one that would get me in if we reached them by 4, so off we pedaled to the dentist. They fortunately had a large front room (with chairs) by reception, so Maureen had an indoor place to wait with the bikes and all our stuff. I waited for a bit, then had an X-ray, then waited a bit, then consulted with the dentist. He diagnosed an infection of the root and offered me three options: root canal, extraction (! ), or nothing (just antibiotics). Sensing the wisdom of getting this managed in a place where I nominally speak the language, I went for the root canal. By 7 pm, it was done and we were out of there and I felt great. For a couple hours. Unlike past root canals, this one has not been smooth. More ibuprofen followed, and a trip to the pharmacy this morning. Armed with antibiotics and paracetamol with codeine, we want back to the hotel to rest. About that time, my face started to swell. Lovely. So back to the dentist we went. More antibiotics, thus another trip to the pharmacy. They were very nice, remembered us from the morning visit, and offered sympathy and advice for pain management in addition to the drugs. We’ve opted for trains for the next two travel days, and are hoping for bike-friendlier storage than what we encountered from Banbury to Coventry. I’m also hoping for less pain and a normal-sized face sometime in the next few days. I would lean toward getting the dental work done now. Though it was much cheaper to have a root canal in the UK than in the US, I would not want to try dental work in Italy–nor repeat it here. Eerily similar to my infected tooth/root canal adventure in February. I hope you’re feeling better soon! Thanks! Definitely not something I would wish on anyone. Hope the post didn’t trigger too many flashbacks or tooth twinges. The lasting effect is that it changed my perception of my teeth. Instead of seeing them as little lumps of bone I have to take care of, now I see them as 28 tiny ticking time bombs. Given my own dental adventures in the past year (this was root canal #3), I would say that’s about right!